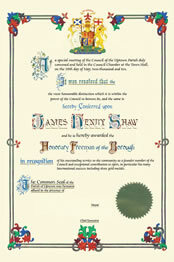 The cost of presenting traditional freedom scrolls may be a barrier to those who would like to mark the achievements and contributions of individual residents. 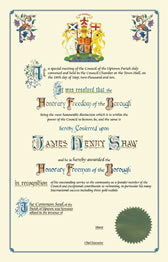 Shaw's, who have vast experience in the production of hand-crafted freedom scrolls, are now able to offer a solution for councils with limited funds. Our electronically printed scrolls are based on hand drawn artwork but created on computers to keep costs down. 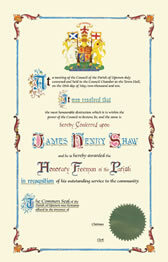 A selection of templates is available and wording is, of course, bespoke to the individual requirements of the council. Prices range from £100 to £200 depending on the level of detail. The scrolls are produced on cream wove paper to give the highest quality appearance and a full framing service, with a range of different styles of mounting, is available at additional cost. 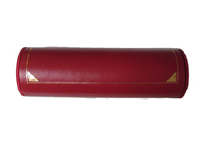 Your scroll can also be encased within a Persian Moroccan leather casket for spectacular presentation. Please allow two full working weeks for delivery. Call Shaw's to discuss your requirements on 01322 621100 or alternatively email sales@shaws.co.uk. 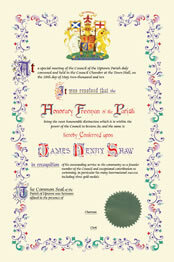 For details of our bespoke hand-illuminated scrolls, please click here.